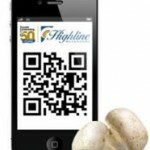 Highline, the largest mushroom producer in North America, uses QR Codes powered by Qfuse to win the “produce section battle” and engage customers. In the produce aisle of the local supermarket, most shoppers just see fruits and vegetables. Not the marketing team at Highline Mushrooms. To Highline, the largest mushroom producer in North America, the produce section is a battleground for customers—and a highly competitive one. After all, most mushrooms look pretty much alike. To win this “produce section battle,” Highline recently took a new approach. They started by looking at their packaging, and asking a few critical questions: What if that tiny label could show that the mushrooms inside came from a 50-year-old family farm totally committed to pesticide-free growing? And what if it could offer a customer something that led them to think beyond their shopping list and toss a box into their cart? Regulations prevented the Highline team from doing much to augment their packaging graphically. But then they thought of a better idea: connecting in-store shoppers with the Highline brand through their smartphones. The team envisioned QR codes on every package that linked to an intuitive mobile site, influencing shoppers as they made their final decisions on what to buy. Highline focused their mobile experience on recipes. They sought to provide shoppers new ideas for things to try, complete with beautiful photography and user comments, all right there in the store. 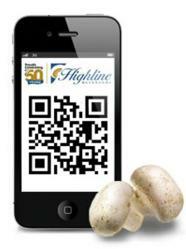 Naturally, the recipes would feature Highline Mushrooms. “The recipes show how much you can do with mushrooms, and the mobile site gives them an evocative, interactive experience right while they stand in the store,” Rhyno notes. 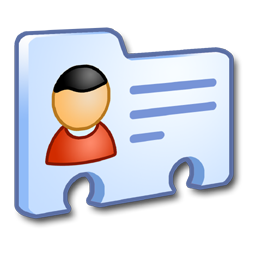 Their vision in place, Highline turned its attention to finding a provider who could work within its budget and deliver both the QR technology and a high-performing mobile site. The move paid off. Just three months since launching the recipe campaign, shoppers have scanned Highline’s most popular mushroom, the Whole White, more than 2,250 times and begun to actively engage with the featured recipes. The results to date strengthen Highline’s commitment to the connected media approach.